We have a variety of great events for you to come to. 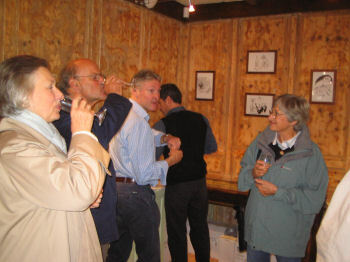 Each of our events is really enjoyable and you always learn a little more about the world of wine. Many of these events are expected to be popular so we suggest letting us know as soon as you can if you believe you might be interested in coming, so we can block off some spaces for you. This will be one of our "great" dinners: we are honoured to have with us the head man from one of the most respected chateaux in Bordeaux. Classified as a 3rd growth in 1855, Château Kirwan in Margaux is nowadays back on top form, producing some stunning and widely acclaimed wines. This will be another of our "great" dinners: we are delighted that the owner of one of the best quality châteaux in Bordeaux, Château Kirwan in Margaux, will be our guest presenter. Classified as a 3rd growth in the 1855 classification, this château is nowadays producing some stunning and widely acclaimed wines. Our venue will be the four star Hôtel Château Tilques between Ardres and Saint-Omer and because this will be such a major Boursot dinner, we will be trialling menus beforehand to ensure the highest possible quality of food to go with the great wines. You can of course ask Monsieur Brousse about all matters Bordelais and I'm sure that he will be up for a bit of lively discussion! Tickets for this Gourmet Dinner are 84€ (around £67) per person for this four course dinner. At the last count, it looks as if we will be comparing a pair of dry whites at our reception, moving on to four reds from Château Kirwan, and finishing up with a Premier Grand Cru Classé Barsac. This should be a winelover's dream. In March, we held a lovely evening at the cosy Les Terrasses de l’Enclos next door to Boulogne’s cathedral up in the Old Town. Scallops, followed by spring lamb (served pink of course), local cheeses and then a rich chocolate dessert were washed down with Saint-Réol Grand Cru champagne, Montlouis from the Loire, Chorey-lès-Beaune from Burgundy, Irancy from the Chablis area, Piaffer from the Gers, and finally a sweet red Maury from just north of the Pyrenees. It was a happy evening! I talked about various “surprising” wines, in other words wines that many people might not have thought to pick off a shelf. As you might imagine, wines such as Sancerre, Chablis and Saint-Emilion sell themselves by virtue of their names and not unexpectedly, many folk are reluctant to experiment with “different” wines without trying them first. This was designed to open our guests’ eyes and I believe that it was successful in that respect. In addition, I believe that we will run another dinner at this attractive and welcoming venue in Spring 2014. "The Sheer Variety from Champagne" hosted by Guy Boursot at Hotel Château Tllques January is when most of us need a bit of cheering up. So, on the 29th we will be hosting a thoroughly relaxing and enjoyable evening in the cosy surroundings of the four star Hotel Château Tilques. Most of us are given a glass of champagne and we think "that’s nice!" and yes, we are aware that there are some differences between the various brands on the market, but have we ever had a chance to compare several different champagnes side by side? As I will be pointing out, there is a wide variety of styles and indeed we will be contrasting non-vintage, vintage, rosé and sweet champagnes over our four courses of dinner. As you may know, my family has been involved with the Champagne trade since the early 19th century (see www.boursot.co.uk/champagne.html) and indeed I was chairman of the Champagne Academy, the UK body that represents the interests of the Grande Marque champagne houses and have given many talks on, and taken tours to, Champagne. So I’d like to think that you will be in good hands for this evening! Sunday 9th December: Ardres' Christmas Market and Boursot's Christmas Lunch at La Griotte, Ardres Ah, it's the season of Christmas markets in Europe! So easily accessible from Britain, the town of Ardres always injects some fun and colour into an otherwise grey time of the year. From 10am that day, the annual Turkey Festival will be held about 20 minutes away in Licques, a village famed for its outdoor reared chickens and turkeys. Here, a flock of local turkeys is "shepherded" up the main street. Dotted along the route you can enjoy stew served from a huge steaming cauldron, eat roasted meat from street barbecues and you can even try out "Licquoise", a fiery local liqueur that will help to keep you warm. All for free. There are musicians and confrères and there is also a simple Christmas Market brimming with local produce. It is all typically "local French". And then to lunch at La Griotte on the green in Ardres, which provides great quality "home cooking". The informal four course lunch will be preceded by a bubbly reception and then accompanied by a further five Boursot wines, and everything costs just 55€ (around £44 at today's rate). We suggest you "do" the Ardres Christmas Market after lunch by which time everyone's spirits will have been warmed up! Père Noel is normally found to be abseiling down the outside of the church at around 6pm, throwing goodies to many of the local children gathered below! This is a fun day out and for many, makes a great start to the Christmas season. This lunch is now sold out, but there is no reason why you cannot still come to the Christmas Market and other activities. There are plenty of restaurants in Ardres and its surrounding area – and of course our shop will be open! As soon as news circulated about the success of last year's Blues Buster event at the Three Musketeers, we were asked when we might repeat our formula of culinary classes, wine classes and a Gourmet Dinner combined in one event. The idea is not so much to be taught how to cook but to experience the kitchens of a quality restaurant and be given several useful culinary tips in the preparation of the dinner that we would come to enjoy that evening. This is tutored by David, chef proprietor of the hotel who speaks English having cheffed in London. At the same time, there will be wine masterclasses during which you can taste and compare wines from several different areas across France and learn about what is going on behind the scenes in each of these areas and more generally with the global trends. The price of the dinner will be, as last year, 74€ (about £59) per person. We have blocked off bedrooms at the hotel, so please say if you would like to take up a room from our allocation. For this occasion they are giving a special rate of 120€ per double room plus 10€ per person for breakfast. Just when you thought that winter couldn't get any more grey and bleak at the end of January, here's something to introduce a bit of colour and entertainment! Well, this could be an interesting evening! Bring a couple of chums – it should be fun! Our dinner will be in the vaulted cellar of Saint-Omer’s finest restaurant, Le Cygne. Our wines will be served during dinner and then at the end of the meal we will appreciate a selection of cognacs from this top quality family producer that was established in 1880. A member of the Fillioux family will be with us for our dinner. This evening will illuminate you as to how cognac is made, what makes it unique and we will of course compare a few examples of old cognacs. The pretty town of Saint-Omer has a number of bars and restaurants around the main square, as well as a beautiful cathedral, and is always worth visiting. We will also be happy to point you towards various local hotels - within easy walking distance! Tickets for the dinner are 89€ all inclusive (about £74 at today’s rate). Burgundy is one of France’s most confusing viticultural areas. It produces highly sought exquisite wines from Pinot Noir for its reds and from Chardonnay for its whites - names include Meursault, Montrachet and Musigny. It’s an area that is different to, say, Bordeaux where one name produces one wine. In Burgundy, just when you think you’ve found a name that you enjoy, such as Gevrey-Chambertin, you might see a bottle with the identical name but with a slightly different label, you buy it and it is simply not the same as the one you had previously. Why not? Is there a guaranteed route to finding the right Burgundy at the right price at all times? Is it best to buy from growers or from negociants? We have had dinners with experts such as Faiveley and Leflaive, never forgetting of course the late Paul Bouchard, but on a more fundamental level how can we begin to understand this area and its wines? During our evening we will contrast the "same" wines from different growers, and we will work up the quality scale towards some great names and we will accompany these wines with a fine Burgundian menu. Being from a Burgundy family, and having been passionate about the area and its wines over the last three decades, I will be unravelling some of the mysteries behind one of the greatest wine producing regions of the world. Whilst the venue is still to be confirmed, we will hold this dinner in one of our high quality local restaurants. Tickets for this dinner will be 69€ (about £57 at today’s rate) all-inclusive. Our mid-summer "do" is going to be on Sunday 10th July – an informal four course lunch at the waterside mill hotel Le Moulin at Audenfort just outside Licques, 10 minutes from Ardres. As always we will start with a bubbly reception and then move on to five wines with our lunch. I will be talking about the wines as well as about what is going on in the world of wine at the moment. Tickets for the lunch will be 49€ (about £43 at today’s rate) and accommodation at around 55€ per room is available. It’s a good inexpensive day or weekend away. And it will be fun. Boursot’s 4th Anniversary Weekend started with a tasting of wines from all around France, and was followed by a cheese and chocolate tasting. That afternoon there were also conducted subterranean tours of the old bastions and silos of historic Ardres. 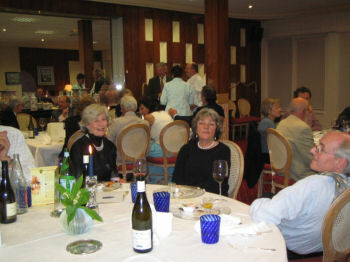 That evening, 50 people repaired to the Hotel Atlantic on the seafront in Wimereux where Boursot’s guest speaker this year was journalist and broadcaster Simon Hoggart. As you may remember, Simon was chairman of BBC Radio 4’s comedy show “The News Quiz” over 13 years, he writes the daily Parliamentary Sketch column in the Guardian and he writes on wine in The Spectator. What was even more relevant was that he had recently written “Life’s Too Short To Drink Cheap Wine” (and who could possibly disagree with that?). Simon Hoggart talked about wine and much of the myth that surrounds it and as a highly qualified parliamentary sketch writer, he gave his views on the world of British politics. Dinner was a stunning affair of five courses, each washed down with an interesting Boursot wine. It was a thoroughly enjoyable evening. 10 - 12.30: Boursot's Wine Collection shop will be open! Christmas in Europe - this is our annual Fun Event! The Ardres Christmas market with all its stalls starts on the Sunday morning but the atmosphere really gets going in the afternoon and when darkness falls, you can see Père Noël abseiling down the church! That morning I'd suggest you visit the annual Fête de la Dinde (Turkey Festival) in Licques, the leading European village for rearing turkeys and chickens. This traditional occasion was established 300 years ago and this event is free of charge and is full of French pageantry with confrères, bands and majorettes. And then come to lunch in Ardres, 10 minutes away! After lunch, we can all "do" the Christmas market! Tickets: 49€ (about £45 at today's rate) to include 4 courses, 6 wines, water, coffee and all entertainment! Boursot's Third Anniversary Dinner will be held at the celebrated Hotel l'Atlantic on the seafront in Wimereux. There are not many hotels in the world that have such an unparalleled setting. Our guest presenter that evening will be Charles Metcalfe, one of the best-known, most spontaneous and amusing wine critics in Britain. 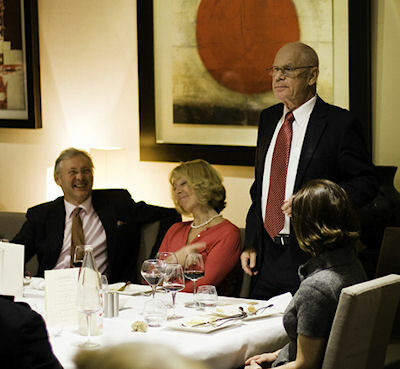 Charles is co-chairman of the International Wine Challenge, the world's biggest wine competition, held annually in London, and was one of the founders of WINE International magazine. For 12 years, he presented drinks as one of the Richard and Judy team on the ITV programme 'This Morning', also working at 'Taste Today' on the Taste TV CFW channel, 'Great Food Live' and 'Sunday Lunch Live' on UK Food (BBC digital TV/Sky TV). Charles, who is married to Kathryn McWhirter, another prominent wine critic, will be enlightening us about new trends in the wine world and about what goes on behind the scenes to select medal winners at the prestigious International Wine Challenge. Alain Delpierre chef patron of the Atlantic is one of the few Maitre Cuisiniers of France, and so we should be assured of a first class dinner! This highly entertaining evening in the luxurious environment of the Atlantic Hotel offers exceptional value - just compare our price to those of other similar dinners being charged by other companies or so-called Societies! This Gourmet Evening offers exceptional value at 95€ (about £80 at today's rate) to include 4 courses, at least 6 wines and a complete evening's entertainment. Martin Krajewski is the owner of two properties in Bordeaux, Château de Sours and Clos Cantenac in Saint-Emilion as well as Songlines vineyard in Australia. Martin told us about some of the highs and lows of running a vineyard, and then explained the background to each of the six wines from his three estates that he had chosen to accompany our four course dinner. We finished the meal with Martin's magnificent Songlines Shiraz made from 100 year old vines at his other vineyard in Australia's McLaren Vale. This red was full of rich fruit flavours yet was well balanced and it should last in the bottle for at least another 20 years. Martin is working here with John Duval who for many years was winemaker for Penfold's Grange Hermitage. Songlines is now widely tipped to be the next "Grange" phenomenon - and you can of course buy it from Boursot's wine list! We hope to have a video compilation of this dinner's highlights available for you to view shortly on the Events page of our website. Last Bank Holiday's lunch was blessed with several good factors - a waterside setting at an old mill, good food, some really interesting wines and a first class speaker. Nicolas Faller from the picturesque town of Ribeauvillé in Alsace, brought with him a passion and an understanding that is rarely seen outside a family wine business. The House of Robert Faller, passed down from father to son since it was established in 1697, makes it one of the oldest Alsace wine producers. The family owns 11 acres of vineyards including some of the prestigious Grand Cru vineyards of Geisberg and Kirchberg, and they produce wine from all the main Alsace grape varieties: Sylvaner, Riesling, Pinot Blanc, Pinot Gris, Muscat, Gewürztraminer and Pinot Noir (red). All Faller wines are of the classic dry Alsace style, with the exception of their rare Vendanges Tardives and Séléction de Grains Nobles wines, which are lusciously sweet and rate amongst the greatest sweet white wines in the world. Nicolas Faller introduced each of the six wines being served and explained some of the reasons why Alsace can often be difficult to understand. Talking about everything from the vines' roots to how the wine got into the glass, this lunch was enjoyed by all the people who attended and it helped to broaden people's knowledge on Alsace. Whilst it was our first attempt at filming one of our events, and we still have much to learn, you can see a two minute compilation of clips of this lunch on this link. You may need to turn up your volume control a little! I have only just learned of this event and if you are interested in live rock music you may want to know about the Main Square Festival in Arras, an hour's drive south of Ardres, between 2nd - 5th July. You can get further details of this major Rock Festival held in the beautiful main square of Arras on this link and then click on "English". Artists include Coldplay, Franz Ferdinand, Lennie Kravitz, Duffy, Lily Allen, Kaiser Chiefs, Kanye West, the Ting Tings and Moby ... and many more. Prices at around £40 are reasonable compared to those charged in the UK. Join Guy Boursot at a relaxed Sunday lunch at the great value Hotel Clément in Ardres. This will be a lunch with local specialities, as always accompanied by a selection of delicious and interesting wines! This will be, simply, a summer Sunday lunch for which you may like to hop over just for the day and enjoy a complete change of tempo and scenery. If you'd like to learn a little more about wine over a relaxing lunch with a few like-minded and friendly people, this is an event for you. The price of this lunch will be just 45€ (about £38 at today's rate) to include 4 courses, 6 wines and all entertainment! Please call or e-mail for tickets. Our Gourmet Dinner at Le François Premier in Ardres was a magnificent and entertaining occasion. It is always a pleasure to experience the extra-ordinary culinary skills of chef owner Gérard Lewandowski and we managed to partner some exquisite wines alongside his various outstanding dishes. I can say with confidence that those who came to this dinner thoroughly enjoyed themselves. For us, it is wonderful to have such a good and reliable restaurant immediately opposite our shop, and if by chance you have never tried the François Premier among the many restaurant choices of Ardres, we strongly recommend that you do. but as always if you have any special dietary requirements, alternatives can be arranged for you. With plenty of rooms available in and around Ardres at very reasonable rates (see our web page for details of places to stay in the area), this will be a weekend of outstanding value, which should also provide you with the perfect excuse to come and stock up! With the improved exchange rate, you can be assured of having a great time whilst buying some really good wines here at substantially reduced prices over their equivalent in the UK. Not only did we have the exquisite cuisine of the 4 star Château Tilques but we had some exceptional wines from the villages of Châteauneuf du Pape and Rasteau in the southern Rhône. Sadly Christophe Mingeaud had to postpone his trip to us, so I talked about the various wines (putting on my best French accent!). Boursot's Wine Collection has developed a strong following with its wines from the excellent Domaine des Escaravailles (easily recognisable with its beetle on the label) in the village of Rasteau and we shall be featuring a selection of their latest wines. Included was a wine that was not released to the rest of the world yet: the white La Galopine is vinified in the style of a top white Burgundy and is something new and very special from Gilles Ferran, the young owner and innovative winemaker of this superb vineyard. 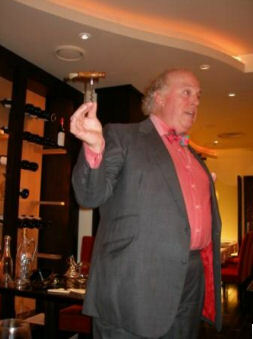 Accolades for Escaravailles from wine critics such as Decanter magazine, the "wine guru" Robert Parker are commonplace. Additionally our Rasteau, La Ponce got Oz Clarke pretty enthused (!) when he tasted it here a couple of months ago (you can see the video clip here). 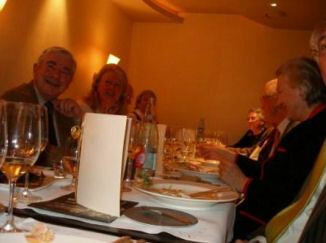 Our Gourmet Dinner at the Hotel Le Relais on Saturday 31st January was really enjoyable. Apart from discussing the disparate aspects of the wine world at the moment, we enjoyed over a four course dinner a horizontal comparison (same year but different producers of Chablis: one from Domaine William Fèvre, the other from Domaine Laroche) and a vertical comparison of different years of the excellent claret: Château Liversan, Cru Bourgeois Supérieur Haut-Médoc . Guests' reactions were interesting and I was pleased to hear that between the Chablis, our own Saint-Martin from Domaine Laroche, the cheaper of the two wines, was preferred for its soft flavour. In comparing the two vintages 2004 and 2005 clarets over dinner, it was clear that our 2004 was currently so much more flavoursome and offered better value than the wine from the "great" year. We rounded off with our unusual but delicious new chestnut liqueur. After all that food and wine, I understand the party went on until the small hours! The Boursot's Wine Collection Gourmet Dinner on 8th November 2008 was at the excellent Restaurant Le Channel in Calais which is a family run, top quality restaurant with a true wine lover's wine list. The evening's speaker was Robin Butler, an expert on antique wine accessories, who has appeared on the Antiques Roadshow among other programmes and has recently completed his book on British Antiques for the Wine Enthusiast. Robin talked about the evolution of wine accessories, showing and passing around several decanters, corkscrews and other antique wine paraphernalia. The rapt audience absorbed every word in the hope of discovering some priceless glass or silver item in their cabinets at home. The scrumptious menu (of which the starter was particularly enjoyed) and the accompanying Boursot wines appears below. The newly arrived Boursot's chestnut liqueur was also tasted for the first time and, judging by the sales the following day, was a success! The weekend programme will start on the Saturday morning (11.30ish) at the Hotel Clément in Ardres with a Wine Masterclass given by me on how to taste, how to identify faults with wine and general chat about what's happening currently in the wine world. We also normally taste two reds and two whites. There will also be a tasting of a wide range of our wines in the shop from 11 - 5: free of charge. 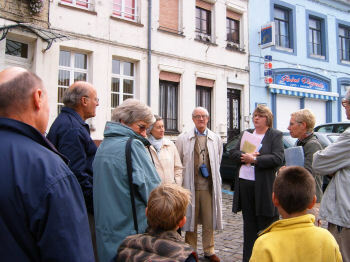 From 2.30pm there will be conducted tours of historic Ardres on foot which last about an hour. These tours will be free of charge to you as a customer. Ardres has plenty of history with its Roman origins and later as a meeting place between the kings Henry VIII and François I. Ardres has a fine 17th century church complete with beautiful stained glass windows, and much other architecture dating from the 17th century. There are also underground silos and bastions, as well as recreational lakes, and our tours are designed to explain a little of the history about this famously beautiful town of the north of France. Anniversary Gourmet Dinner with Patrick Leflaive at Hotel l'Atlantic, Wimereux Alain Delpierre chef patron of the Atlantic has recently been promoted to be one of the few Maitre Cuisiniers of France, and so we should be assured of a first class dinner! He is also about to launch an Ecole de Cuisine which may be of interest to some of you. Our Guest Speaker at this dinner will be the chairman and co-founder of the major Burgundy house, Olivier Leflaive based in the village of Puligny-Montrachet. Patrick, brother of Olivier, Leflaive is an erudite and entertaining speaker (in English of course!). From their launch in 1984, Olivier and Patrick have grown their company to a volume of 800,000 bottles across 40 major markets around the world. In addition, the company Olivier Leflaive Frères is set to increase its top quality portfolio by buying more vineyards in Puligny-Montrachet Premier Cru, Les Folatières; Chevalier-Montrachet Grand Cru; Bienvenues-Bâtard Grand Cru and Bâtard-Montrachet Grand Cru. Olivier Leflaive is a success story and I shall encourage Patrick to talk about his company's development over the last 20 years to it being one of the most respected names in the Burgundy marketplace. Some tickets are still available at 110 euros per person to include 5 courses, all wines, water, coffee and entertainment! This represents exceptional value for a dinner that would typically cost you around £175 in the UK. Sunday 13 July: La Fête de la Belle Roze. La Fête de la Belle Roze is a uniquely Ardesien affair, commemorating Françoise Roze's saving of Ardres from the Spaniards in 1653. A day of fun, stalls and street processions with two giants - La Belle Roze and King Francois 1er. An informal Sunday lunch hosted by Guy Boursot. Tickets: 49 euros per person to include 4 courses, all wines, water and coffee. An informal lunch on the lakes of Ardres. Details to be finalised. More soon. Dinner at Restaurant L'Esplanade, Ardres' new venue. 7.30: Details to be finalised. More soon. Our big Anniversary Weekend on 13th-14th October has already received advance bookings, and if you are interested we suggest advising us as soon as possible as inevitably places are limited. Over that weekend, there will be a wine tasting of a full selection of our wines in our Ardres shop, a Wine Masterclass, Historic Overground Tours of Ardres as well as Underground Visits to Ardres' silos and bastions. The jewel in that weekend will be the Burgundy Gourmet Dinner hosted by Paul Bouchard at the Hotel l'Atlantic in Wimereux. As mentioned in the last newsletter, Saturday 21st April will see another extra-ordinary value Gourmet Dinner. This time I shall be hosting the dinner which will "showcase" many of our new wines from the Loire at the Hotel Château des Tourelles in the village of Le Wast, about 20 minutes from Boursot's Wine Collection in Ardres. Our menu for the evening is set out below and you will see that within the all-inclusive price of £55 / €80 we shall be enjoying among other wines, our delightful new rosé from Sancerre, a delicious new dry white from the Vendée as well as an unctuous sweet white from Bonnezeaux. The restaurant at Château des Tourelles has a reputation for high quality and the wines will of course be spectacular, so that as always we can offer you this package of extraordinary value - an ideal opportunity for you to escape for a weekend. You can even take advantage of our well-priced crossings, courtesy of the Ferry Travel Club on 0870 264 2644 and remember to quote our code "Wine Co". We have also booked bedrooms at the hotel so that you can enjoy the dinner and not have to worry about driving afterwards, and these are priced at €45 per person including breakfast. Please contact us as soon as possible if you would like to reserve tickets. Le Wast is 20 minutes away from Boulogne and the coast, and as you may know there are several good things to do in the area. There is Nausicaa, Europe's largest aquarium in Boulogne, there are golf courses in the vicinity and you will find a list of these as well as of hotels, restaurants and a few other places of interest in the area on this link. We hope you find this helpful. Philippe and Ruth Jonquères d'Oriola came up from Château de Corneilla, their 12th century property just 10 miles north of the Pyrenees, especially to be with Boursot's Wine Collection customers on the evening of Saturday 24th February 2007. In fact they came from one corner of France to the other! 32 people sat down to a five course dinner served with six wines in the atmospheric vaulted cellar of Le Cygne in Saint-Omer, about 25 minutes south of Ardres. The menu as shown below, prepared and cooked by Le Cygne's chef proprietor Jean-François Wident, was of impeccable quality - as always - and whilst food and wine matching can be extremely difficult to get right, this was one of the few occasions where it seemed to work perfectly throughout. 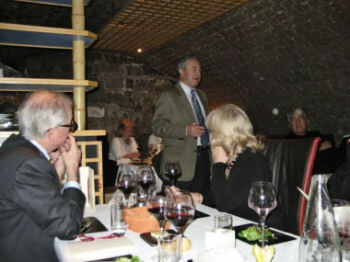 Philippe presented humour and facts on each wine as each course was being served, and it is fair to say that those attending really enjoyed his informal presentation. There was unanimous approval that this Boursot's Wine Collection gourmet dinner provided an exceptional evening - as well as extraordinary value.